Buidling Foundation – Concrete Contractors, Concrete Construction, Concrete Paving | Bernardo Concrete Inc.
Bernardo Concrete, Inc. was contacted by a production company to work on a local production of A & E Flip This House. The project took place in the city of Costa Mesa in Southern Orange County. Costa Mesa is surrounded by the cities of Huntington Beach, Fountain Valley, Irvine, and El Toro. The scope of work included in this project included concrete demolition and concrete construction. 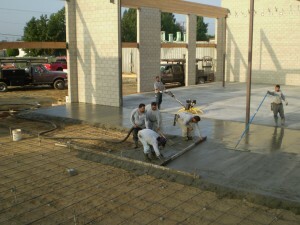 Bernardo Concrete, Inc. was the perfect concrete contractor for the job! The concept behind the show Flip This House is that a house is purchased, fixed up, and then sold for a profit. Many contractors put in their expertise to help make the house and surrounding property profitable and Bernardo Concrete, Inc. was the concrete contractor chosen for this particular house. Their part of this project included the demolition and removal of any concrete on the front of the property, including the driveway, sidewalk, and curb. They also removed the front lawn, giving the landscapers a blank canvas with which to work. Flip this houses production company asked Bernardo Concrete, Inc. a lot of questions before choosing them. Not only was Bernardo required to show proof of all of the insurance and licensing required from a concrete contractor, but they also had to be sure BCI had that a professional look for the cameras. After meeting all of their requirements, Bernardo put their best equipment and men on the project and the rest you can see some time late spring or early summer on your local A & E channel. Bernardo Concrete has been installing concrete for 20 years now. That gives us the wisdom & experience of time and we like to think that it shows in our work. We specialize in industrial, commercial, retail and residential concrete services. We are always looking for a challenging concrete construction project to do so, let us know if you have one by calling Toll Free 888-499-0899 . 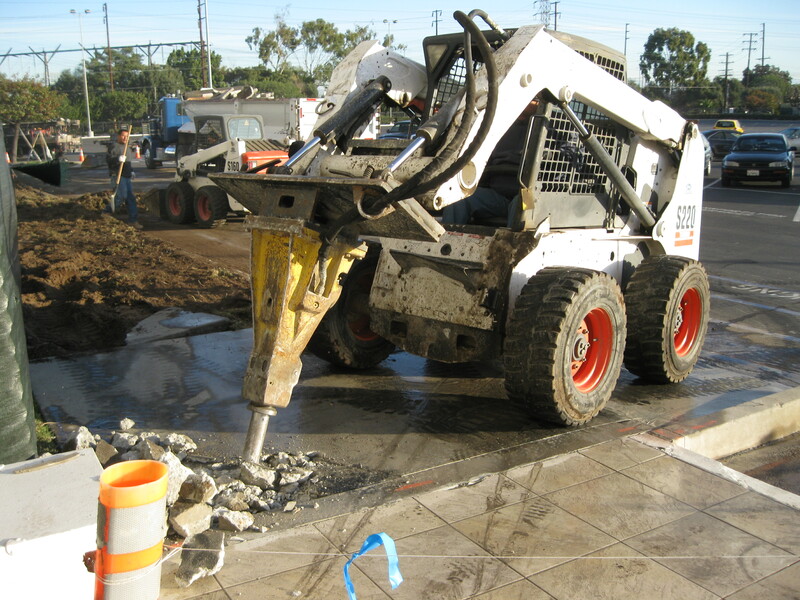 We offer many concrete services including concrete demolition, curb & gutter installation and repair, handicap concrete ramp repair and installation (to ADA code), block wall installation and repair, concrete demolition, core drilling and saw cutting, and many more. There are just too many services to mention all of them so, take a look at our website by clicking on any of the links within this blog. We are located in Orange County California and service the surrounding areas including parts of Los Angeles, Riverside, and San Bernardino. If you have a project that requires a concrete contractor than give Bernardo Concrete a call today and we will get an estimator out to your business for a fast, free quote. For Bernardo Concrete, Building Foundation is a piece of cake when you have the right workers and tools, like we do. First off, to set the concrete foundation, we have to dig the footings, set the re-bar, pour the footings, grade the foundation, and set the grade, all while putting the plastic over the building foundation. Once this is finished, we put sand in the foundation and get the re-bar ready to lay down. From there, we begin to pour the concrete with a pump for the foundation. After the concrete is poured, we then shovel and rod it in order for the concrete to smooth out. Then, Bernardo Concrete will proceed to float the concrete and trawl it. From here, we then rerun huge services like these with the round trawl machine to get the concrete to be smoother. Bernardo Concrete is more than happy to fix and repair any of your concrete needs. We have everything it takes to make you, the customer, happy and our work sites safe. Feel free to call us today! Bernardo Concrete has been installing concrete for 20 years now. That gives us the wisdom & experience of time and we like to think that it shows in our work. We specialize in industrial, commercial, retail and residential concrete services. We are always looking for a challenging concrete construction project to do so, let us know if you have one by calling Toll Free 888-499-0899 . We offer many concrete services including curb and gutter installation and repair, handicap concrete ramp repair and installation (to ADA code), block wall installation and repair, concrete demolition, core drilling and saw cutting, and many more. There are just too many services to mention all of them so, take a look at our website by clicking on any of the links within this blog. We are located in Orange County California and service the surrounding areas including parts of Los Angeles, Riverside, and San Bernardino. If you have a project that requires a concrete contractor, give Bernardo Concrete a call today and we will get an estimator out to your business for a fast, free quote.